Even though I have been designing Lingerie for over thirteen years, I have never designed on CAD, i've used photoshop (self taught) when I had my own brand, but it was Illustrator that I yearned to learn. Though I can produce a pretty accurate first pattern from a drawing, watching the graphics team in previous jobs transform my hand drawing into artwork I wanted to do the same. So this week gone, I booked myself on an Illustrator course at London college of Fashion and fell in love. Proving that no matter how good you are in one area of your expertise it's never too late to learn more. So the week ended with with drawing a trainer - not quite lingerie but now I have the skills I can now start to produce artwork. The first copy of the hard back version of ‘How to become a Lingerie Designer‘ arrived yesterday, it’s been nearly two years from idea to publication. 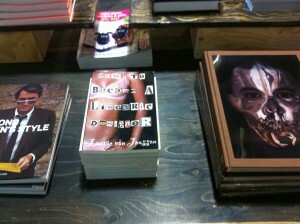 I cheekily checked out what it would look like in shops and laid it out on a pile of books in Urban Outfitters.